The Combined Services Memorial at Westminster Abbey in London was designed by sculptor Gilbert Ledward. 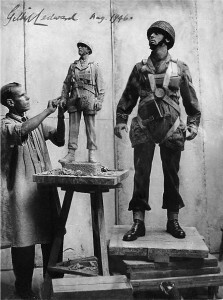 The models for the three figures were serving members of the forces. 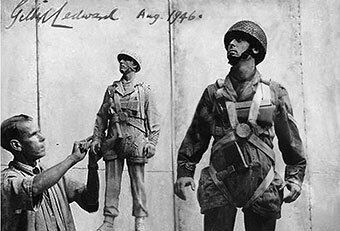 Corporal Howard Elliott modeled for The representative of the Parachute Regiment in this memorial, and I was lucky enough to have been given this following job by one of his relatives. The image below (before image), shows Corporal Howard Elliott modelling for this memorial as sculptor Gilbert Ledward works. 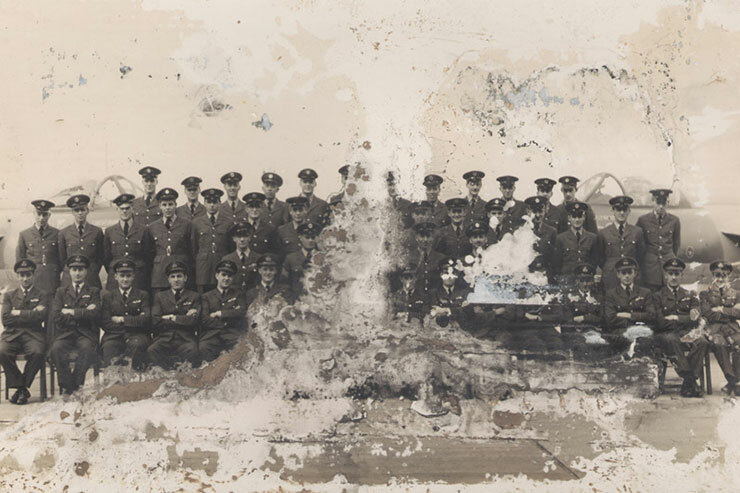 This image was heavily damaged from recent water damage, and as such required an extensive digital repair job. As luck would have it though, despite being heavily damaged, the area where Howard Elliot stands, for the most part, only had fairly minimal damage, and his face remained mostly intact apart from some discolouring and spots of damage there. Also, Gilbert Ledward’s facial features managed to remain unscathed. Facial features are the most time consuming areas to repair, so if the eyes, nose and mouth are spared, this can be a bonus. For the most part, this image had enough areas remaining that could be re-sampled to repair the damaged areas. Despite being a time consuming job, it was repairable. 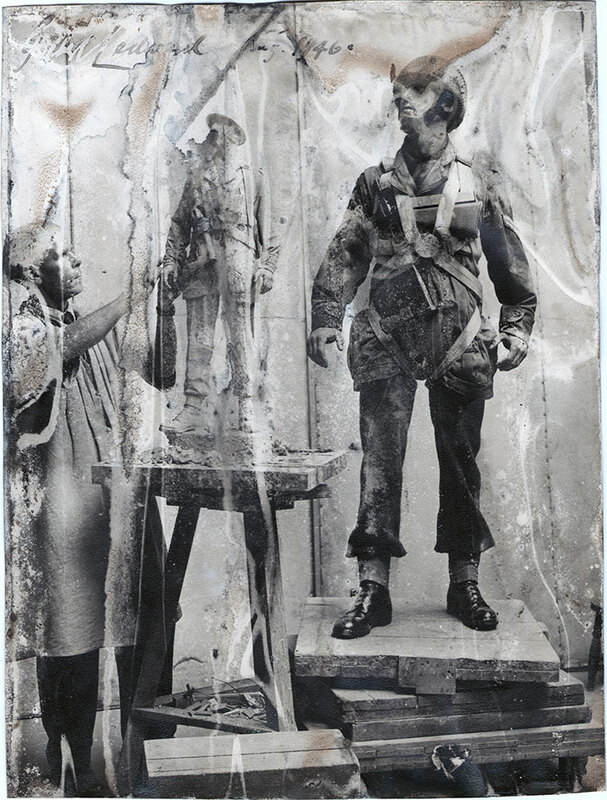 The unfortunate issue with this image was that the sculpture itself was fairly damaged, however, there was a low res photo of this image supplied that had been taken of the original photo prior to it suffering the damage that had occurred. Although being of very low resolution, it was enough to use to replace the original statue, and then further repair could be undertaken on the original photo after scanning. Read more to see the finished result. This job is a major retouch job. As you can see, there has been very extensive damage to this photo. Damage through the centre now obscures some of the men in that area, and this damaged area is virtually lost and beyond repair. 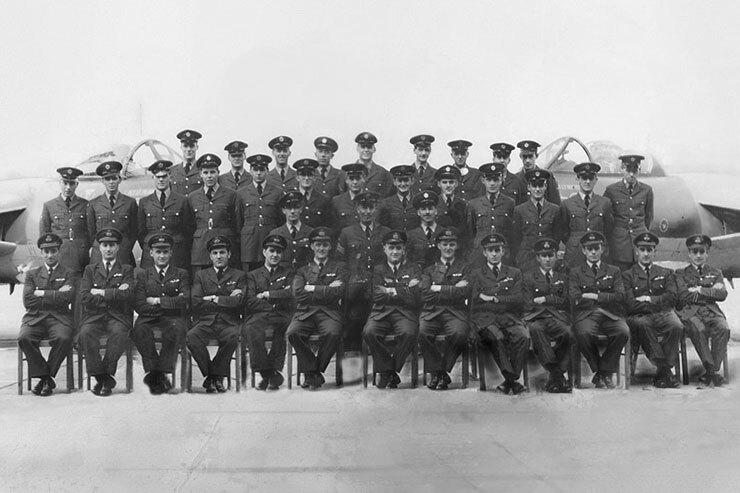 What had to happen was that a sliver through this area had to be chopped out, (digitally of course), and three of the men on the centre were unfortunately removed from the image. Extensive repairs were done around these areas to bring back some of the people at the front. As much of the original was retained, but a few people had to be ‘duplicated’ in order to place more people in areas where people were obscured in the original damaged areas. In fact, in this photo, is Corporal Howard Elliott. If anyone has ever seen the Combined Services Memorial at Westminster Abbey in London, the representative of the Parachute Regiment in this memorial is Corporal Howard Elliott. I was lucky enough to do digital photo restoration work on the original photograph of Howard Elliott posing for sculptor Gilbert Ledward for this part of the memorial, who designed this memorial.